In a column titled "Are Open Houses A Waste Of Time? A Contrary View to the Contrarians", real estate author and speaker Melissa Zavala debunks the notion that open houses are not worthwhile and offers several great tips for hosting a successful open house event. HomeVisit customers know that leveraging incredible photography and immersive virtual tours can help drive traffic to open house events and put you one step closer to finding the perfect buyer for your home seller. First impressions are integral and that's where HomeVisit Fusion Photography comes in! Here's three brand new listings, all open this weekend! Listing agent: Marc Fleisher, Long & Foster Real Estate, Inc. Learn about HomeVisit Fusion Photography and HomeVisit Pro HD Video. When it comes to marketing luxury homes, no one does it like HomeVisit. With Fusion Photography, Pro HD Video, the finest quality Print Materials and more, we cover all of your marketing bases and then some. Take a look at three brand new luxury listings below, all featuring HomeVisit Fusion Photography and all available to view in person this weekend! Listing agent: Pamela Powers, Long & Foster Real Estate, Inc. Listing agent: Timothy Harper & Scott Harper, Long & Foster Real Estate, Inc. Earlier this week DC UrbanTurf shed some light on the current sellers market condition of the DC real estate market. Though inventory is on the rise, the demand for homes still outweighs the supply. 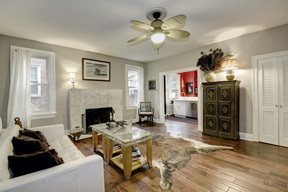 That said, there is no shortage of beautiful HomeVisit Virtual Tours to explore. Take a look three new listings below, all featuring HomeVisit Fusion Photography and all available to view in person! Amazingly, for the fifth straight week mortgage rates have reached a new low. Conditions are favorable for those in the market for a home. Perhaps this is the weekend for you to find your dream home? Take a look these beauties below, all featuring HomeVisit Fusion Photography! Listing agent: Kimberly Cestari, W.C. & A.N. Miller Realtors, A Long & Foster Co.
Be sure not to miss the Floor Plan Tour of this home! Learn about this special add-on feature to the HomeVisit Virtual Tour. Listing agent: Nancy Shalett, Long & Foster Real Estate, Inc.
Memorial Day weekend marks the start of pool season in the DC area. For this week's Spotlight, we've selected three brand new listings that feature exquisite backyard pools. Marvel at the HomeVisit Fusion Photography for these amazing homes then go see them in person this weekend. Listing agent: Lydia Benson, W.C. & A.N. Miller Realtors, A Long & Foster Co. The homes in this week's Spotlight offer a veritable feast for the eyes! Marvel at the HomeVisit Fusion Photography & Pro HD Video for these amazing homes then go see them in person this weekend. Get ready to fall in love with your dream home! Listing agent: Thomas Corcoran, Long & Foster Real Estate, Inc.
As we head into peak Cherry Blossom season, inventory in the active DC real estate market continues to climb. DC Urban Turf reported this week that for the sixth month in a row, active listings for sale in the DC area increased compared to the previous year. There are over 1300 homes open for viewing this week, but here are three we think are particularly special. These Tours all feature the now-standard Fusion Photography. Listing agent: Andrea Evers & Melissa Chen, Evers & Co. Welcome to 2510 Upton Street, NW, an elegant light-filled home on a private half acre of landscaped grounds in the prestigious Forest Hills neighborhood. This 1934 expanded Tudor has the timeless air of an English manor with its surrounding gardens. The welcome surprise of this home is its spacious, open interior. It has been thoughtfully expanded and renovated over the years and now enjoys fabulous natural light, high ceilings, several decks and patios, beautiful windows and skylights that look out on gardens and treetops, a two car garage and four finished levels of living space. Presenting stunning new construction in a great location! This two-story, two bedroom, two and a half bath Penthouse located in a sleek and luxurious building features a private balcony, expansive living space, high-end contemporary finishes, clean lines, and lots of light. The designer kitchen features stainless steel appliances, gleaming hardwood floors, quartz countertops, and gas cooking. Located just one block from the metro, this spectacular unit is within easy walking distance of the popular shops, bars and restaurants of vibrant 14th Street. Also see Unit 1 and Unit 2, both also open Sunday! Character and charm abound in this three bedroom, four and one half bathroom end-unit townhome conveniently located in the private community of Chain Bridge Terrace. This extraordinary home is complete with elevator, spacious and open main level with gourmet kitchen, light-filled family room with built-ins, formal living and dining rooms, expansive master suite with luxurious bath, walk-out lower level with theater room, and a two-car garage. The Spotlight is back with three more absolutely stunning homes. View the HomeVisit Virtual Tours now and see them all in person this weekend. These Tours all feature the now-standard Fusion Photography. And stayed tuned for some exciting news next week regarding improvements in our Print Operations. You won't believe the upgrade we have in store for you! Listing agent: Creig Northrop, Creig Northrop Team of Long & Foster Real Estate, Inc. This stunning all brick Colonial home in the sought-after Chase neighborhood of Ellicot City offers over 7,200 square feet of luxury living, screened-in deck and in-ground pool. This home offers an impeccable, versatile floor plan with open flow living spaces and easy transitions to exceptional outdoor venues. The interior of the home showcases incomparable architectural details, built-ins galore, custom moldings, soaring ceilings and an abundance of natural light sure to please any discerning buyer. Listing agent: Nicolas Masson, Long & Foster Real Estate, Inc. 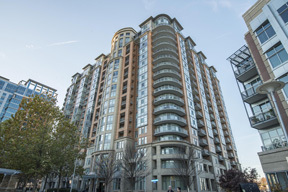 Choose to live on top of the city, at the "Lofts of Ontario", located between Adams Morgan & Lanier Heights. This truly unique three levels condo mixes the authenticity of a 1900's Townhouse with contemporary architecture, built in 2006. Three bedrooms and two bathrooms with large south facing windows that provide lots of light. The 430 square foot private roof deck allows you to host elegant dinners or informal BBQs with friends - a spectacular place to watch the July 4th fireworks. Just steps from downtown, close to everything! This stunning home, built in 1917 and meticulously renovated and restored to it's original grandeur, is in the heart of Alexandria City and on the periphery of historic Old Town. It's southern exposure provides glorious light and views include the magnificent Masonic Temple. Within walking distance to the metro, and 5 minute drive to major thoroughfares, the home is a commuter's dream. A carriage house with separate living quarters crowns this beautiful piece of property. + Featuring Cleveland Park Hidden Gem, Charming Suburban Maryland Cape Cod, Luxury Tysons Condo & Renovated Friendship Heights Home! The holiday season may already be upon us, but the DC real estate market is still booming. HomeVisit is proud to spotlight four offerings, all open this weekend, featuring our stunning Fusion Photography and priced under $1 million. 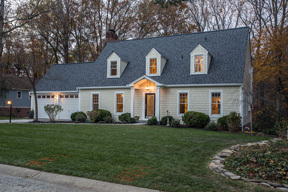 First is 2830 UPTON ST NW, presented by Nancy Taylor Bubes of Washington Fine Properties. This lovely Cleveland Park home combines convenient city living with a quiet neighborhood and plenty of living and outdoor space. This energy-efficient 3 bedroom, 2 bath home features a unique floor plan with large south facing windows to maximize natural light. Situated on a large lot and featuring beautiful architecture, this home offers spacious living areas and bedrooms and an eat-in kitchen with an attached family room. 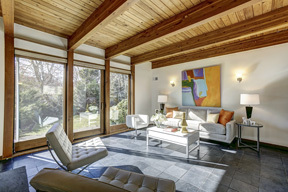 Marvel at the architectural details with HomeVisit's Virtual Tour featuring Fusion Photography. complete with four generous bedrooms and newly remodeled bathrooms boasting ceramic tile, modern fixtures and chic lighting. Spacious living continues in the light-filled lower level offering a large recreation room with fireplace and walk-out to a second deck. Just steps away to the community marina where you can take in panoramic Severna River water view. The HomeVisit Virtual Tour features Fusion and Elevated Photography, as well as HD Video and 360 Panoramic images. Next, we are proud to showcase 8220 Crestwood Heights Drive #609, presented by Jeff Secrest of Frankly Realty. This luxury two bedroom, two bathroom condo is part of the amenity rich Park Crest high-rise in Tyson's Corner, Virginia. Walk out the door of this luxury building and you are steps from Harris Teeter, Starbucks and other shopping. This unit offers over 1,200 square feet of living space, with 9 foot ceilings, custom molding, stainless appliances and 2 deeded garage parking spaces. Be sure to check out the HomeVisit Virtual Tour to view the amazing details of this contemporary luxury. Finally, we are proud to showcase 4130 Military Road NW, presented by Kimberly Cestari of W.C. & A.N. Miller. This beautiful home is just two blocks to all that Friendship Heights has to offer, including metro, shops & restaurants. It has recently been beautifully renovated with new hardwood floors, windows, a gourmet kitchen with stainless steel Bosch appliances and Viking stove, and new fixtures throughout all baths. Fantastic outdoor amenities include deck, patio & fenced rear yard. Don't miss the HomeVisit Virtual Tour for this wonderful home. See them all in person this weekend!